After a long thought process, i came up with a way to sort out people who are trying to use the Roxio Game Capture on Non HDTV and Older TVs with only Audio And Video in. So i made a video walkthrough. Hope this helps some people. But you would be good to clarify that this works with "some" Old TVs and not all. My "Sony Trinitron 21" work like a charm but my "Mother Samsung 29" (with Component input) not, in RCA mode of course. My Sony TYrinitron 21 work like a charm but my Mother Samsung 29 (with Component input) not, in RCA mode of course. My problem is not that the television is in black and white, or that my sound is out of sync, but that my recording and preview on my PC are in black and white. Is this still how I can solve my problem? might be, like Cauptain said. some tvs are different. all i can say is try it and if it doesn't come back and request some help. Do you try inverse mode?? (Component to HDTV and RCA to COMPOST (RCA) analog capture card. Very interesting schema for X360. No work for PS3 (Limited by ONE output only. 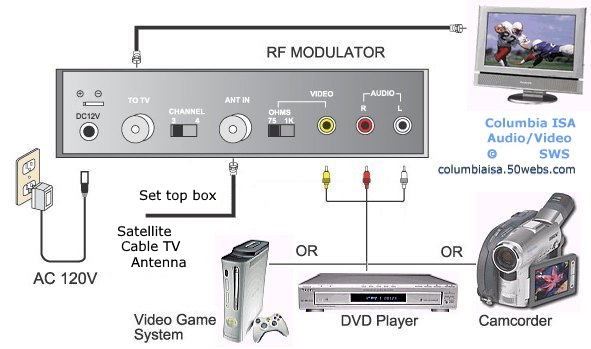 if you use the RF Modulator and my video, it will bypass the Xbox HDTV switch. you can just plug the XBOX 360 yellow plug right into the tv Yellow/Video in port. i just use the adapter and rca cable to give me more room from the capture box. I do exactly as you did but the image on my computer is really fuzzy and isnt a video. I did as you showed in the video but all I have is Black Screen on one or the other depending if I have HD or SD AV on. Any ideas on how to get this to work on a non HD tv with composite and the usual YWR inputs? I have tried everything listed including the rf modulator and none of it worked. It's starting to look like I'm SoL unless I can come up with a better tv. It works fine on my 50" HD-TV, but it is a nuisance to my family members. i hope it will work for my old TV. single male / male video (yellow) cable in one of those video adapters? I have a video to video cable and was wondering if i could get around buying that component cable you used on the roxio out > to TV in. What he used was a nicer Composite cable made by Phillips not a cheapy. Any way you look at it you need to get the Red/White audio and the Yellow video to the TV. If you want to use a separate Yellow video you could but why when the Composite cable you're using for audio already has it in it. The only reason I can think of is if you had a Female/Male video cable then you could eliminate the need for the adapter and use a separate cable. actually if the capture box is close enough to the tv couldn't you just use the ones that come with it? ...and then just the audio (red white) from the male/male composite cables? I have a sony trinitron(it has component) but when I set it up roxio keeps saying no signal, but when I go and edit my resolution settings my tv has flashes and/or goes blank. My problem is that when i open the record menu i don't even get any options, they're all "grey" or faded so i cant click them and my capture "box" is black... what can i do?